Join artists from all over Houston at our 12×12 Art Show where all the art is, you guessed, 12″ x 12″! 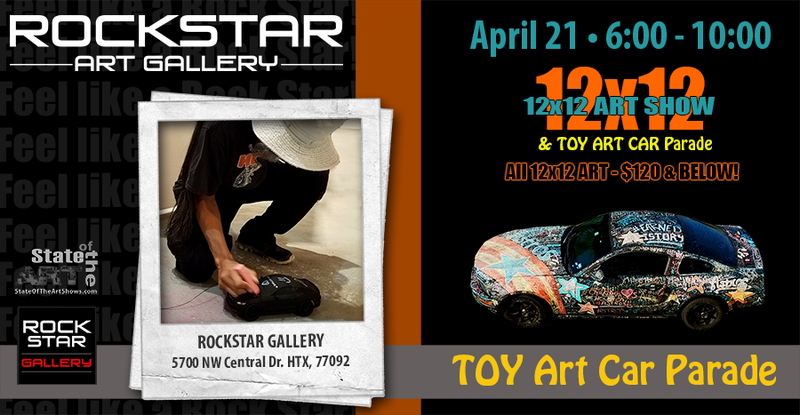 Houston is known for having the largest Art Car Parade in the world, but the fun does not have to stop after the parade this year, because the week after the BIG parade downtown, ROCKSTAR Gallery is having a parade of it’s own… a toy art car parade! This is a parade that everyone can participate in! The parade is at 6, the 12×12 art show will follow, the cars will be on display after the parade for you to view, some will even be for sale! Admission is free! Donations are appreciated so that we can continue putting on State-Of-The-Art-Shows for you to enjoy!